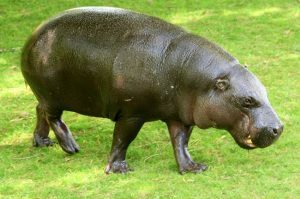 The Pygmy Hippopotamus is a species of dwarf or very small hippopotamid, compared to the other common hippo species. By size, these mammals are about a fifth of the Common African Hippopotamus and spend less time in the water. 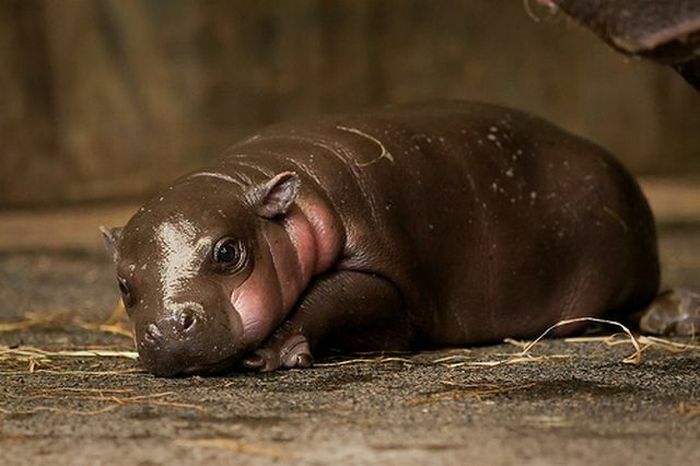 Presently, the pygmy hippopotami has been declared as an endangered species. Size: This dwarf species is only 60 inches in length and 30 inches in height at the shoulders. Weight: It weighs between 180 and 275 kg (397–606 pounds). 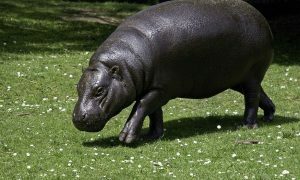 Body: Skin is the same as common hippo having a thin epidermis covered by a layer of dermis a few centimeters thick. The eyes are small and round, while the orbits and the nostrils are much less pronounced than other species. Tail: The tail is only about 11 inches long. The exact lifespan of the pygmy hippopotamus is not known; however, it is believed that their longevity is anything between 30 and 50 years. They are found in the interior forests in West Africa confined to Liberia, and a small population in the neighboring countries of the Ivory Coast Sierra Leone, and Guinea. 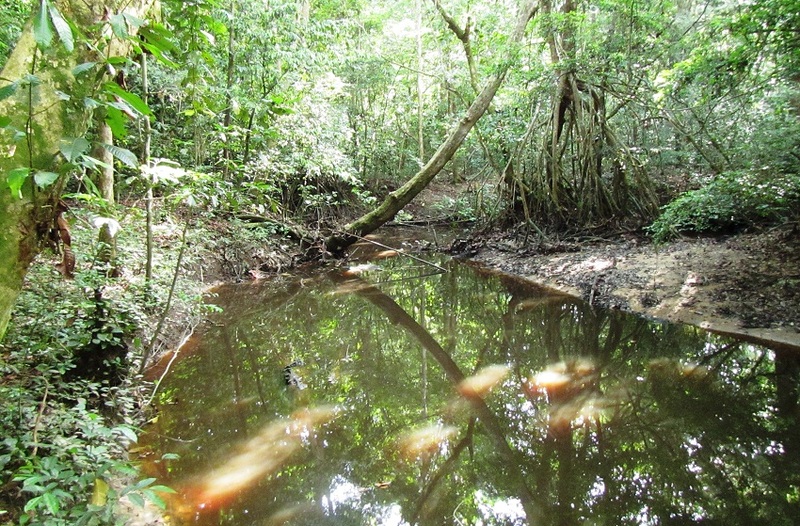 The pygmy hippopotamuses are often found resting in a hidden state in the wallows, swamps, and the rivers. They have been classified under two subspecies – the Choeropsis liberiensis liberiensis and the Choeropsis liberiensis heslopi, with the former being the nominate species. The pygmy hippos are shy, nocturnal herbivores and are solitary creatures. They mark their homes with their droppings while resting all day in the swamps, especially if it is hot and sunny, coming out of the water after sunset to search for food. Both the males and the females have their own territories marked, with the males having a more extensive area compared to their female counterparts. 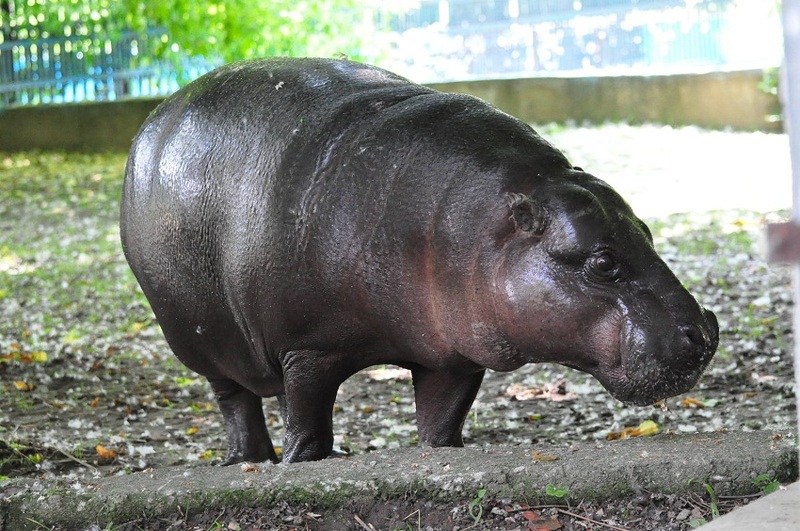 Pygmy hippos spend relatively less time in the water. They are prone to taking refuge in water when it feels threatened. Being a much diffident animal, an individual’s home might overlap others, and even then, they are known to tolerate the presence of each other in their territories. The pygmy hippopotamuses are not very vocal and seldom emit much noises and sounds. They have been recorded emitting mild calls including grunting, hissing, snorting, and squeaking. The pygmy hippopotamuses feed on a variety of plant matter including tender shoots, leaves, roots, succulents, grasses, and fallen fruits. 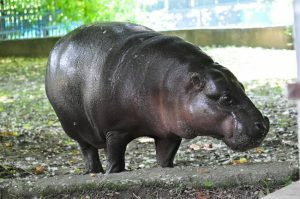 As noticed by researchers in the zoo, or for captive individuals, the female pygmy hippo is usually ready for mating when it sees a male waiting nearby. They can mate both on land and in the water. However, their breeding season in the wild is not known. Usually, one single baby hippopotamus is born at a time, and the gestation period is six to seven months. 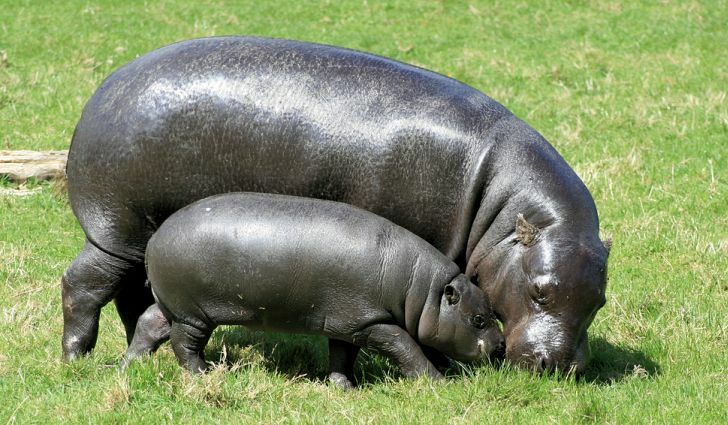 Unlike most other hippo species, pygmy hippos give birth to their calves on land. A newborn weighs around 10 to 14 pounds (4.5 to 6.4 kg). During the first few weeks, the female hippo tucks the calf in the wild bushes milking it since the juvenile is unable to walk properly. Calves remain with their mothers until weaning and hide near the water while the mother leaves in search for food. Weaning takes place between six and eight months of age. Interestingly, the baby grows quite fast, and within five months, their offspring grow approximately ten times their birth weight and is ready for foraging. 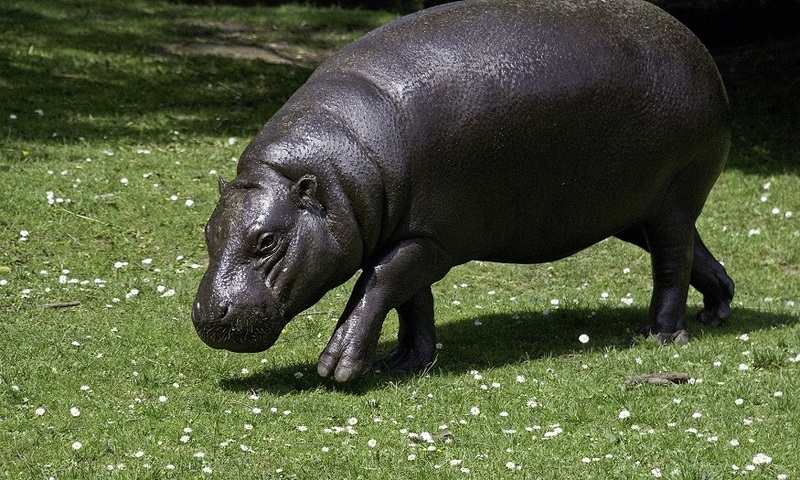 Even with a massive body, they are excellent swimmers, unlike most other hippo species. This ability assist these dwarf hippos to escape from predators faster. The pygmy hippopotamus secretes a reddish brown fluid through the skin pores, which allow them to release extra heat in the hot weather of the tropical habitat. The primary enemies of these small hippos are leopards, pythons, and crocodiles. The IUCN 3.1 has enlisted these animals as ‘EN’ (endangered) under their red list. 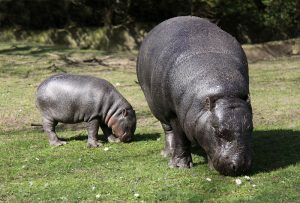 The male pygmy hippopotamus is called a ‘bull’, the female is called a ‘cow’, while the baby is their ‘calf’. 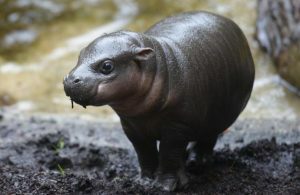 Pygmy hippos were not known outside of West Africa until the 19th century. 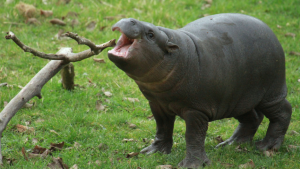 At present, there are fewer than 3,000 estimated pygmy hippos remaining in the wild. Several African folklore exist about these animals in West Africa. One of the most popular folktales says that pygmy hippopotami carry diamonds in their mouths at nighttime to light up their pathways through the jungle, and if a hunter can capture the animal, he can get the diamond for himself. Their numbers are declining in the wild, while humans are destroying their habitat, and they continue to be hunted down by the locals for bush meat.